We at Opinion Corp(dba Pissed Consumer) have hoped that the last post about aggressive SEO practices would put some sense into SEO players. We wanted to stress out the fact that we pay attention to the details and review all the facts. We hoped Reputation Management Companies would stop making gross errors and at least try playing by the rules. Apparently they are still not quite with us. We intend to use Pissed Consumer blog to talk about the facts and show all the dirty SEO and ORM techniques as we learn about them. This time around we will show how the company is trying to forge a DMCA notice and serve it on Google in an attempt to take down Pissed Consumer (PC) and CBS content from the Google Index. A newly created website claims that they are the owners of a copyright to the content in question and have been since forever, and demand that the infringing sites (PC and CBS)be removed from the index based on the DMCA! Oh, REALLY ??? The most effective way to combat this kind of behavior is to apply the Streisand Effect to the issues that the perpetrators here are trying to silence. Frankfort Herald, frankfortherald.com is a newspaper website that, despite its trustworthy name, has never really existed, for all intents and purposes, before January 2016 (according to archive.org). However, this did not stop them from sending a DMCA notice to Google claiming that they were the owners of the copyrighted material from Pissed Consumer thatwas published back in 2012. 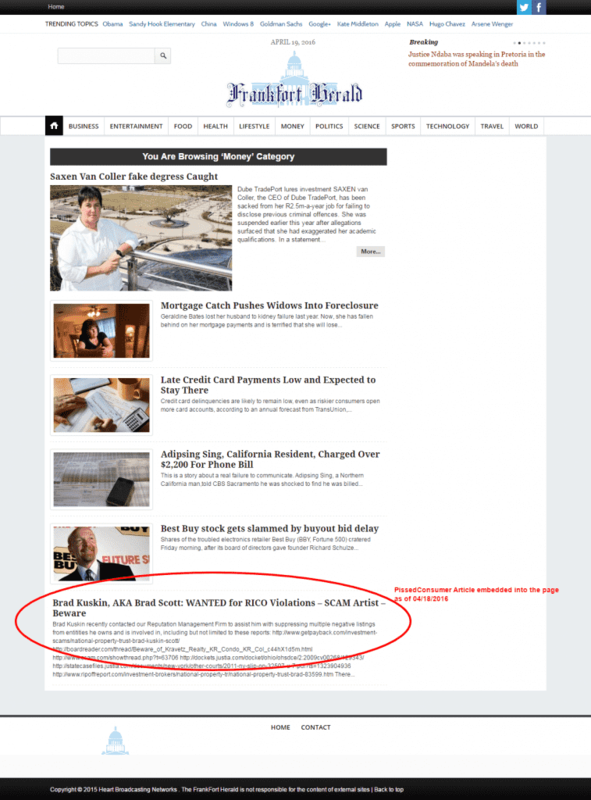 On April 15, 2016 Pissed Consumer received a takedown notice for a review where frankfortherald.com claimed that they originally wrote the piece of news in question back on January 5, 2012. The review is about Brad Kuskin, and they claimed they had it published only 2 days prior to the article appearing on PissedConsumer.com. 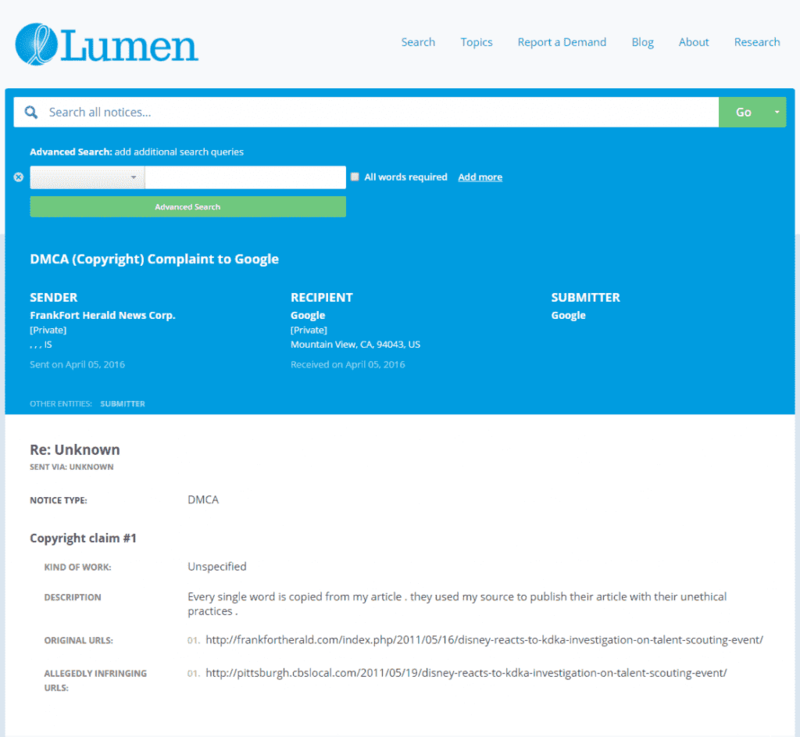 We take DMCA notices very seriously and we do our research in such cases. 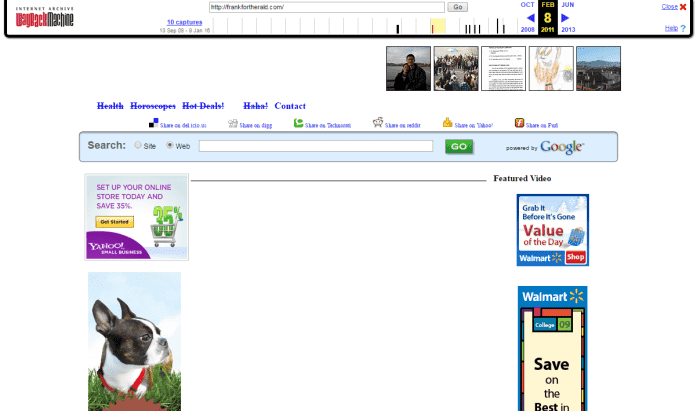 Well, we checked the mentioned domain using the Internet Archive (Archive.org), and the first time frankfortherald.com has any sort of meaningful content is January of 2016… It seems that before that time the website was simply parked in cyberspace (or the Internet space) with no data on it. How is CBS involved in this? With the additional research on Lumen Database we see that the same Frankfort Herald was used to take down content from CBS. I am curious to see what CBS will do with this information. 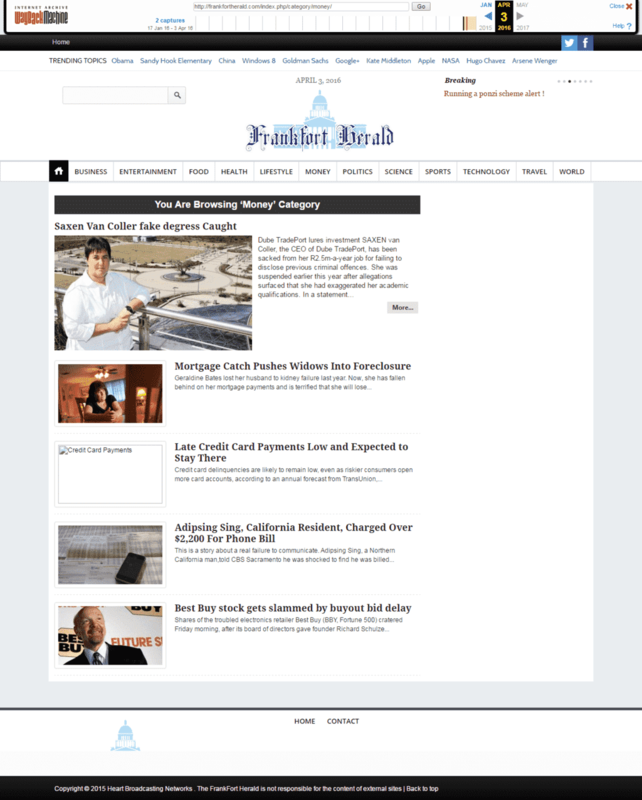 Just as in the case with PissedConsumer.com, Frankfort Herald claims that they are the copyright holder for the CBS Pittsburg Article from 2011. I am curious to see what Marty Griffin, CBS Pittsburg Investigative reporter, who wrote the piece in 2011 for CBS, would say. This is the article that frankfortherald.com attempts to remove from Google using this tactic.